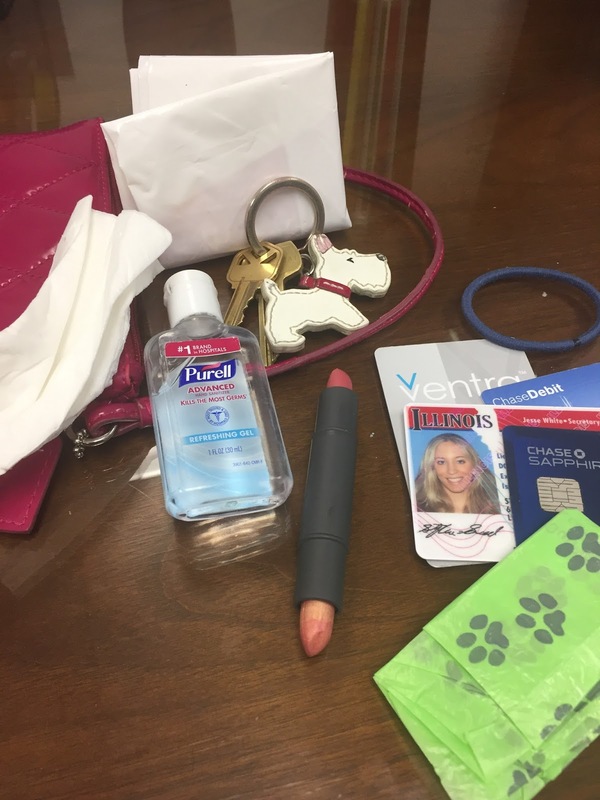 I applied minimalism to the contents of my purse right away, pretty much as soon as I decluttered my closet (which was step one for me, many years ago.) I always hated carrying a lot of things when it made my purse get heavy and my shoulder started hurting. But also, I was horrible at leaving my purse places when I went out at night. It was lost and stolen so many times, I've lost count. The number of new phones and IDs I've paid for.... shudder. When I was in law school, my doorman at my apartment building would hold my keys at the front desk every night I went out with my best friend Meredith because I locked myself out so many times. I've since learned to attach them to my bra strap, not to worry. And I'm much better about keeping track of my belongings now, I swear! Age, wisdom, and a complete ban on Jameson. Keys. One is to my house, one is to the office. My parent's house doesn't require keys and if there's an emergency at my dad's office, I have those keys at home. I could make it simpler and take the dog charm off, but why? Credit Card and Debit Card. These are the only cards I have, so I generally bring both and use them for different things. I really should just pick one though and stick with it. Transit Pass. I swipe this 4 times a day between one bus and one train to work and the same home. I usually bring it when I go out for other things because I can usually take the bus or train to meet my friends at a bar, which is much cheaper than an Uber. Dog Poop Bag. I have a pile that I take specifically when I walk Hawkeye, but I keep one in my purse at all times for emergencies. It's come in handy many times, and not just for Hawkeye - for other dog owners in a bind, for wrapping or carrying something, for covering my hand to touch something icky, it's multi-use! Reusable Bag. Chicago now taxes 7 cents per bag at every store, if you happen to forget your own bag. I will never pay that. This is just a folded up plastic Walgreens bag for now, because I forgot my nicer one at my mom's house. Lipstick. This is a double ended small lipstick from Bite Beauty that John's sister got me for Christmas. Bite is cruelty free and natural, and these feel more like a balm than a drying lipstick. Hand Sanitizer. People are filthy, simple as that. Hand sanitizer might not be the most natural, zero waste thing I carry around but you try touching anything on the Chicago public transit system and not reaching for it immediately. Tissue. Just one, folded all nice with the poop bag. Just in case. Hair Tie. It never fails that I always want to put up my hair when I don't have a hair tie. A Deck of Cards. If I'm meeting my friends at a bar, I have never left home without these. Health Insurance Card. I have a copy on Evernote should I need it when it's not with me, but otherwise I just grab this when I'm going to the doctor. And that's it! Is your purse as minimalist as mine? What other essentials do you carry?